The NRA press conference featuring a prepared speech from Wayne LaPierre. The NRA speech was far from brilliant. Mr. LaPierre not only sadly attacked mental health and video games, but is apparently now an aspiring film critic as well. If you want an intelligent film review, check out Roger Ebert. The NRA isn't the place to be for the study of cinema, to make an understatement. Wayne LaPierre's rambling was littered with baseless attacks on free speech, mental health, video games, and a bombastic nonsensical conjuring up of "Monsters." You cannot save the 2nd Amendment by destroying the 1st, nor can you elevate knowledge and awareness of mental health by demonizing it. Regardless of Mr. LaPierre's odd theories about music and movies, I'll likely watch (and enjoy) The Unforgiven, The Usual Suspects, Pulp Fiction, and Full Metal Jacket again. And, some Alice Cooper hits my CD player from time to time. Mr. LaPierre seems clueless that NRA spokesman Ted Nugent's "Stranglehold" has been ranked as the 31st greatest guitar solo of all time by Guitar World. It also can be found in the video game, Grand Theft Auto: Vice City Stories, on the V-ROCK radio station. I also enjoy the Three Stooges, though wannabe censor LaPierre would likely find them poisonously violent, along with various Bugs Bunny / Road Runner shorts. To be fair, Wayne fared much better on "Meet the Press." My takeway was simple. If we want better security in schools, then it must be provided. That is the message and a clesr, self-authenticating one. I personally find it horribly insulting that some one in the media needs to inform me that a tragedy is tragic. Every American should. It is pandering of the worst kind, the notion being that if you don't mindlessly hold your head in shame and light a candle you are somehow not understanding of a truly lamentable incident. Consider the case of the mayor who would be King, the aspiring Napoleon of New York City, the loyal Democrat / Republican / Independent Michael Bloomberg. Not content with just controlling soft drink size and trying to regulate circumcision, Bloomberg defines the constriction of Liberty and Freedom by one man who knows so very little, but wants to control so much. 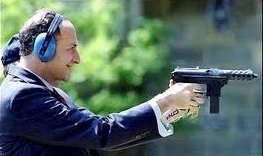 Senator Chuck Schumer, having fun with a TEC-9 assault pisol. C'mon, Chuck, get some safety glasses on . . . you'll shoot your eye out, Son. With his armed body guards and a concealed carry permit, Chuck has it made. A good idea for Chuck, but not for other residents of Brooklyn, the most populous of New York City's five boroughs, when Senator Schumer lives. Senator Barbara Boxer reportly has a concealed carry permit, as does New York Democrat Senator Chuck Schumer. That's even though they employ armed body-guards. Famed anti-Second Amendment Senator Dianne Feinstein, on record as wanting to ban all firearms and seize guns, acts a little bit differently of course when it is her right to arm. She armed herself, she "was going to take them with her" if somebody wanted to take her out. Bless her little white socks, and her Concealed Carry Permit . . . that she says she has used when she has gone to the hospital to visit. Senator Feinstein she participated in a citywide gun turn-in program that was intended to create a statue from the donated guns that were to be melted down. One of her police body guards at the time mentioned that she contributed a cheap model for the meltdown, while retaining her .357 magnum revolver for her own personal self-defense. Ann Coulter, on the other hand, got it right: http://frontpagemag.com/2012/ann-coulter/we-know-how-to-stop-school-shootings/ . I've mentioned it before, but Susann Gratia Hupp has warned of the danger we have unintentionally created with Gun-Free Zones for years. Her story is memorialized in her book, From Luby's To the Legislature, a must-read for every American. Who else "gets it"? Take a look: http://kontradictions.wordpress.com/2012/08/09/why-not-renew-the-assault-weapons-ban-well-ill-tell-you/ . That's a far better summary than the NRA has ever managed, to make an understatement. Anyone can quickly understand it. For some, the grandstanding is more important than the message: why we have a Second Amendment in the first place, and why it needs to be so very jealously guarded. Circuit Judge Alex Kozinski explained it recently. "Judges know very well how to read the Constitution broadly when they are sympathetic to the right being asserted. We have held, without much ado, that speech, or . . . the press also means the Internet, and that persons, houses, papers, and effects also means public telephone booths. When a particular right comports especially well with our notions of good social policy, we build magnificent legal edifices on elliptical constitutional phrasesor even the white spaces between lines of constitutional text. But, as the panel amply demonstrates, when were none too keen on a particular constitutional guarantee, we can be equally ingenious in burying language that is incontrovertibly there. It is wrong to use some constitutional provisions as spring-boards for major social change while treating others like senile relatives to be cooped up in a nursing home until they quit annoying us. As guardians of the Constitution, we must be consistent in interpreting its provisions. If we adopt a jurisprudence sympathetic to individual rights, we must give broad compass to all constitutional provisions that protect individuals from tyranny. If we take a more statist approach, we must give all such provisions narrow scope. Expanding some to gargantuan proportions while discarding others like a crumpled gum wrapper is not faithfully applying the Constitution; its using our power as federal judges to constitutionalize our personal preferences. The able judges of the panel majority are usually very sympathetic to individual rights, but they have succumbed to the temptation to pick and choose. Had they brought the same generous approach to the Second Amendment that they routinely bring to the First, Fourth and selected portions of the Fifth, they would have had no trouble finding an individual right to bear arms. Indeed, to conclude otherwise, they had to ignore binding precedent. United States v. Miller (1939) did not hold that the defendants lacked standing to raise a Second Amendment defense, even though the government argued the collective rights theory in its brief. The Supreme Court reached the Second Amendment claim and rejected it on the merits after finding no evidence that Millers weapona sawed-off shotgunwas reasonably susceptible to militia use. We are bound not only by the outcome of Miller but also by its rationale. If Millers claim was dead on arrival because it was raised by a person rather than a state, why would the Court have bothered discussing whether a sawed-off shotgun was suitable for militia use? The panel majority not only ignores Millers test; it renders most of the opinion wholly superfluous. As an inferior court, we may not tell the Supreme Court it was out to lunch when it last visited a constitutional provision. The majority falls prey to the delusionpopular in some circlesthat ordinary people are too careless and stupid to own guns, and we would be far better off leaving all weapons in the hands of professionals on the government payroll. But the simple truthborn of experienceis that tyranny thrives best where government need not fear the wrath of an armed people. Our own sorry history bears this out: Disarmament was the tool of choice for subjugating both slaves and free blacks in the South. In Florida, patrols searched blacks homes for weapons, confiscated those found and punished their owners without judicial process. In the North, by contrast, blacks exercised their right to bear arms to defend against racial mob violence. As Chief Justice Taney well appreciated, the institution of slavery required a class of people who lacked the means to resist. See Dred Scott v. Sandford, (1857) (finding black citizenship unthinkable because it would give blacks the right to keep and carry arms wherever they went). A revolt by Nat Turner and a few dozen other armed blacks could be put down without much difficulty; one by four million armed blacks would have meant big trouble. All too many of the other great tragedies of historyStalins atrocities, the killing fields of Cambodia, the Holocaust, to name but a fewwere perpetrated by armed troops against unarmed populations. Many could well have been avoided or mitigated, had the perpetrators known their intended victims were equipped with a rifle and twenty bullets apiece, as the Militia Act required here. If a few hundred Jewish fighters in the Warsaw Ghetto could hold off the Wehrmacht for almost a month with only a handful of weapons, six million Jews armed with rifles could not so easily have been herded into cattle cars. My excellent colleagues have forgotten these bitter lessons of history. The prospect of tyranny may not grab the headlines the way vivid stories of gun crime routinely do. But few saw the Third Reich coming until it was too late. The Second Amendment is a doomsday provision, one designed for those exceptionally rare circumstances where all other rights have failedwhere the government refuses to stand for reelection and silences those who protest; where courts have lost the courage to oppose, or can find no one to enforce their decrees. However improbable these contingencies may seem today, facing them unprepared is a mistake a free people get to make only once. The sheer ponderousness of the panels opinionthe mountain of verbiage it must deploy to explain away these fourteen short words of constitutional textrefutes its thesis far more convincingly than anything I might say. The panels labored effort to smother the Second Amendment by sheer body weight has all the grace of a sumo wrestler trying to kill a rattlesnake by sitting on itand is just as likely to succeed." Judge Alex Kozinski (born July 23, 1950) is a judge on the United States Court of Appeals for the Ninth Circuit. Appointed by President Ronald Reagan on November 7, 1985, Kozinski has won supporters from the left and the right with his common-sense decisions and libertarian instinct. His writing is clear and often humorous, and has been featured in mainstream publications such as Forbes and Slate. He was born in Bucharest, Romania but his parents, both Holocaust survivors, brought him to America in 1962 (he was only 12). They settled in Los Feliz, California and his father, Moses, ran a small grocery store there. Kozinski attended John Marshall High School and UCLA. He received his J.D. from UCLA Law School in 1975 (he was one of the top students) and went on to clerk for then-Ninth Circuit Judge Anthony Kennedy and Chief Justice Warren Burger. Then he spent a few years in private practice before going to work in the White Hosue counsel's office for then-President Ronald Reagan. Kozinski received a job as chief judge at the newly-formed Federal Claims Court. Then, at the age of 35, Reagan appointed him to the Ninth Circuit, making him the youngest federal appeals court judge in the country.